NORFOLK, Va. (AP) — A big change is looming on the horizon near Jamestown Island, site of Britain’s first permanent settlement in North America: 17 transmission towers — four nearly as tall as the Statue of Liberty — are set to rise to help meet Virginia’s growing energy appetite. But not everyone is electrified by the prospect, never mind the $90 million the utility is spreading around to blunt the impact on this tourist region steeped in early American history. The project calls for stringing power lines across the muddy James River, an undertaking the utility says is vital to maintaining the region’s power supply as aging coal-fired plants are mothballed. Richmond-based Dominion Energy already has begun the federally required payouts. And the so-called mitigation funding is providing rare windfalls to local groups in an era of dwindling public dollars for preservation efforts. Groups receiving the money have expressed gratitude, though some remain opposed to the towers. The project could take nearly two years to complete. Work has already begun on foundations for the towers. Eventually, the power lines are to cross a 4-mile (6.4 kilometers) stretch of the broad James River within view of the eastern tip of Jamestown Island, although not its historic fort. To accommodate river barge traffic, four of the towers are to rise as high as 295 feet (90 meters) — just shy of lady Liberty’s 305-foot (93 meter) height from the pedestal’s ground level to the torch. More than 400 years ago, Britain established Jamestown, aided by Capt. John Smith, a colorful adventurer and explorer who is part of the tourist draw here. Because power lines would cut through areas with historical significance, the federal government required the mitigation funding by Dominion, which is flowing through an array of state agencies and nonprofit foundations. The Pamunkey Tribe, for instance, will use its money to expand its fish hatchery and other projects. Another tribe, the Chickahominy, will acquire 105 acres (42 hectares) along the river. 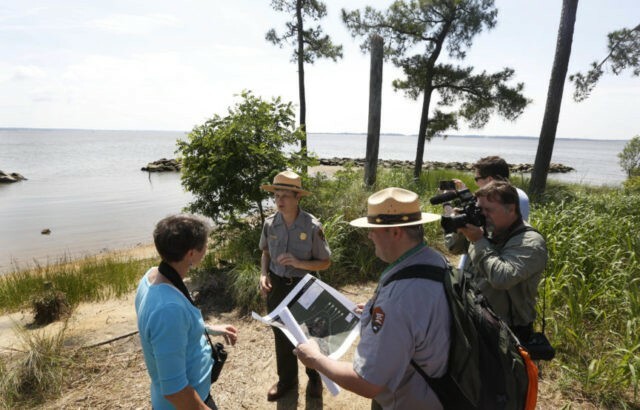 Money will also bolster shorelines, improve water quality and help to preserve five battlefield sites associated with the American Revolution and the Civil War. Dominion says the towers are crucial to providing reliable service to 600,000 people living between the York and James rivers, including the city of Newport News, as well as a Busch Gardens theme park and Joint Base Langley-Eustis — a combined U.S. Air Force and Army installation. The lines will carry electricity from a nuclear power station across the river and other sources, compensating for the coal-powered plants shutting down because of new clean-air regulations. Dominion spokeswoman Bonita Billingsley Harris said the project’s location poses the least impact of the options considered. Critics, meanwhile, are still calling for Dominion to run the transmission lines underwater or elsewhere. But Dominion said the underwater proposal would balloon costs from $180 million to at least $500 million, with ratepayers absorbing the expense. Harris also said underground lines would be inadequate for meeting future power needs. Conservationists are fighting the project in court, saying it should be redesigned or relocated. Williamson said the power lines will extend across the water on a portion of the river that has lacked crossings of any kind for miles, a rare phenomenon on the East Coast. But Dominion contends the James already flows through a well-developed region and has steady maritime traffic. In October, a federal judge rejected a request by conservation groups to immediately halt construction. But the judge said the merits of the case will be considered as it moves forward. Besides Jamestown, founded in 1607, the area includes the Carter’s Grove plantation, a National Historic Landmark built beside the James River in the 1750s. There’s also the Colonial Parkway, a scenic route linking Yorktown, Williamsburg and Jamestown. The power lines would be visible from Carter’s Grove, some lookouts along the parkway and the eastern tip of Jamestown Island. Among groups benefiting from Dominion’s payout is Belmead on the James Inc., which hopes to preserve more than 2,000 acres further upriver. The group is getting $750,000. Belmead, a former plantation site, also housed schools for black and native American students between 1895 and 1972.